The Whalehead Preservation Trust and the Outer Banks Community Foundation have established two new charitable funds for the preservation and celebration of Whalehead in Historic Corolla. The George Alden “Buck” Thornton III Memorial Fund was established in memory of the legendary volunteer who helped bring the once-crumbling Whalehead Club back to life. Mr. Thornton served as Chairman of the Whalehead Preservation Trust from 1996 to 2003 and spearheaded the very successful Knight’s Ball fundraisers, leading the way to the spectacular restoration of one of the Outer Banks’s most stunning crown jewels. More than 50 donors to date have contributed to the Buck Thornton Memorial Fund, which will memorialize and celebrate Mr. Thornton and his legacy at Whalehead, by preserving and celebrating the historic house, its storied past, its bright future, and its surrounding acreage. The Franklin Y. Hundley Education Fund was established with a gift from an anonymous donor who wished to provide perpetual support of innovation, growth, and new educational programs at Whalehead. The fund is in honor of a beloved family member and may support new education initiatives such as “Night of a Thousand Stars,” which inspired over 2,500 Currituck students to read more than 1,000,000 pages last fall. “We are so grateful to all of the donors behind the Franklin Y. Hundley Education Fund and the Buck Thornton Memorial Fund for supporting the cultural treasure of Whalehead,” said Jeanne Meiggs, President of the Whalehead Preservation Trust. The Franklin Y. Hundley Education Fund was established as a permanent endowment, which means that the funds are invested in perpetuity with the Community Foundation, and only a portion is spent each year. In contrast, the Buck Thornton Memorial Fund is not endowed, giving Whalehead Trust the ability to use the full fund at any time, as needs and opportunities arise to memorialize Buck and celebrate Whalehead for future generations. “These two new innovative funds are great examples of the flexible and diverse options we can offer to donors and nonprofits,” said Lorelei Costa, executive director of the Community Foundation. Additionally, anyone can contribute to the Buck Thornton Memorial Fund and/or the Franklin Y. Hundley Education Fund from the Community Foundation’s online donation page. For more information on establishing a Family Fund for Whalehead, contact Ms. Costa at 252-261-8839. The Outer Banks Community Foundation is a public charity that connects people who care with causes that matter. The Community Foundation manages $12 million in 125 charitable funds for individuals and agencies, awards charitable grants to local nonprofits, administers 40 scholarship funds, and provides tailored services to help donors pursue their charitable interests. Since its inception in 1982, the Community Foundation has awarded more than $5 million in grants and scholarships to local nonprofits and students. The Whalehead Preservation Trust, a 501(c)3 nonprofit organization, is entrusted by the citizens of Currituck County with the responsibility to preserve, protect, and interpret the historic architectural, cultural, decorative, ecological, and social significance of Whalehead in Historic Corolla and surrounding grounds to the public though tours, exhibits, educational programs, and events. It is located just past milepost 11 on Route 12 North in Corolla, NC. Photo Caption: Leaders from Whalehead and the Community Foundation celebrate two new Family Funds for Whalehead. 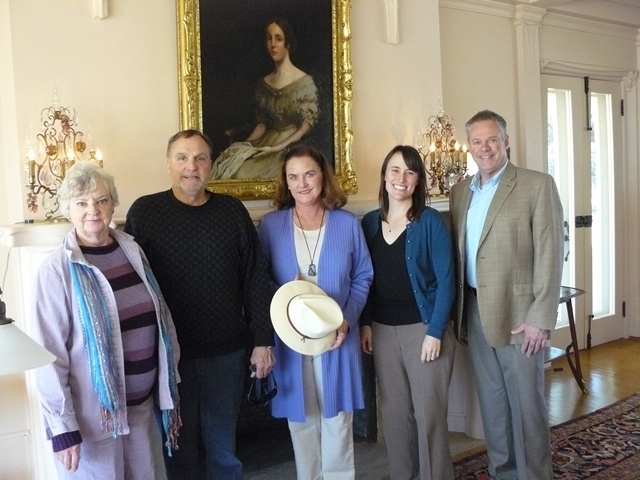 Posing in Whalehead’s library in front of a painting of Anna Magill Knight, from left to right: Jeanne Meiggs, Ed Olsen, Bronwyn Thornton (holding Buck’s favorite hat), Lorelei Costa, and Ray Meiggs.